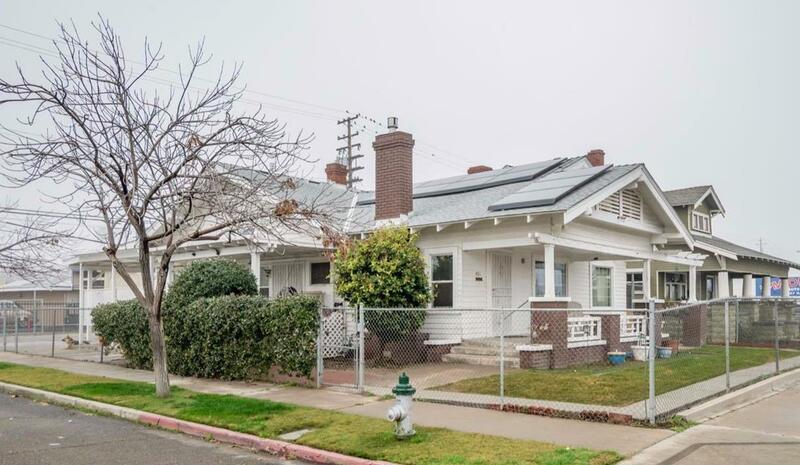 Take a step back in time when you enter this lovely 1927 home situated on a corner lot. With old world charm, this home features 3 bedrooms, 1.5 bathrooms, cozy living room with fireplace, media room, large dining room with vintage built-in hutches. Step upstairs to the light filled sunroom/bedroom and brighten your day simply by entering, perfect for an artist studio or office. An abundance of storage space is located in the attic easily accessible. Updated to include modern creature comforts such as central heat/cooling, dual pane windows and solar panels. Located conveniently to the Tower District and Downtown Fresno, and easy access to freeways. Great opportunity for home and business combination with CMX mixed use zoning. Property is fully fenced with 3 storage sheds and RV parking. Listing provided courtesy of Vicki Davis of Guarantee Real Estate.